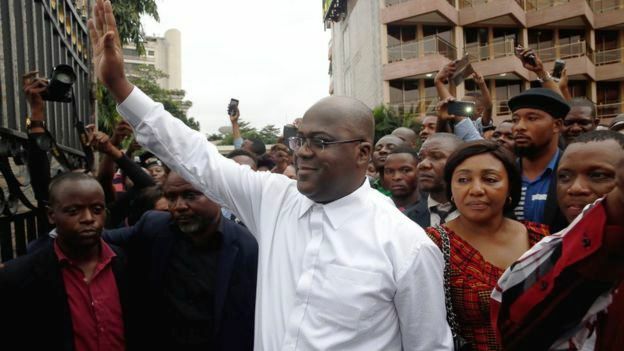 Agency, 20 January : The Democratic Republic of Congo’s highest court has ruled to uphold the national electoral commission’s controversial declaration of Felix Tshesekedi as winner of the Dec. 30 presidential elections. The ruling, which came late on Saturday, will likely be met with condemnation from local activists and supporters of Martin Fayulu, the former Exxon Mobil executive, who several independent polls have estimated to have won as high as 60% of the national vote. The DR Congo’s electoral commission, CENI, instead claimed Tshesekedi won around 38% while Fayulu was runner up with 35%. But those numbers have been challenged by credible bodies including Congo’s Catholic Church which had more than 40,000 independent pollsters watching the vote come in. In an unusual step, the African Union broke ranks and said it had “serious doubts” about the official results. In its ruling the court said Fayulu failed to show the electoral commission had announced false results and according to the BBC the court declared, ”Felix Tshisekedi president of the Democratic Republic of Congo by simple majority”. It means Tshisekedi is expected to be sworn in within 10 days. Fayulu, who filed the original case, rejected the court’s ruling describing it as a “constitutional coup” and said he should now be seen as the “sole legitimate president-elect” of DR Congo. There have now been several reports Tshesekedi worked out a deal with current president Joseph Kabila when it became clear that Kabila’s preferred candidate Emmanuel Shadary was nowhere close to winning. Kabila, who has ruled since 2001 is reported to be keen to protect his legacy. Fayulu was backed by two of Kabila’s strongest opponents Jean-Pierre Bemba and the tycoon Moise Katumbi, who has been barred from contesting. There will now be fears of strong protests and possibly political clashes in coming days, particularly in the eastern regions of sub Saharan Africa’s largest nation state.